Connecting Members provides more than just a website. We deliver powerful communication to your members! When your church or school needs to get the word out you'll have a dependable tool to deliver the message. 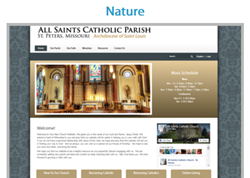 With advanced permission settings built into every website you'll have the flexibility to create unique pages specific to your needs. You can even build out special pages for groups to manage themselves. 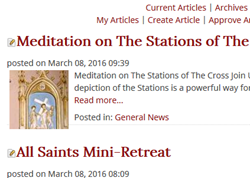 Our Theme Library provides a great starting point for your Catholic website. We've designed beautiful themes with the most requested features. 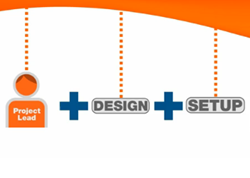 Our Designers fine-tune your design, NOT YOU! Stop wasting time getting frustrated trying to layout the perfect home page. Let the pros handle the tedius work. 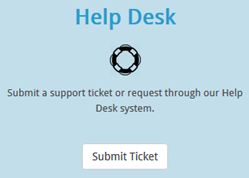 Dedicated support reps are available to handle your call when you need help. Plus the online Knowledgebase is built directly into yoru website. Need to add more content to a page or rearrange what's there? It's as simple and dragging the content around until you like where it is at. It's that easy to change the layout. 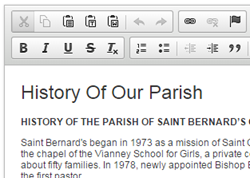 The text editor is loaded with speacial features that make building a web page easy. It even has a safe undo function so you can revert back to the last five versions. Your home page image slides will look great with the Image Crop tool. Crop and resize any image to the exact pixels and reduce the file size without losing quality. 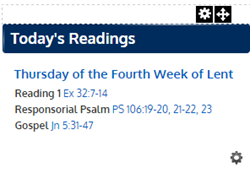 Theres a simple way to add the daily readings to your website directly from the USCCB website. 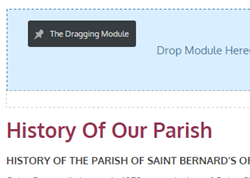 Just drag and drop the module on any page and it updates daily. 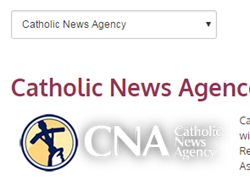 We make it easy to display the latest Catholic news from the most trusted sources on the net. 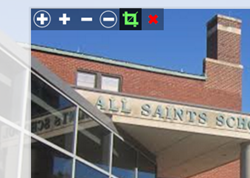 Drag and drop the module on a page and select the news source. 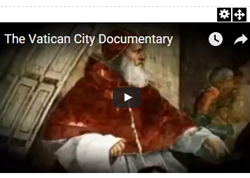 In one easy step you can add videos from the Vatican's You Tube channel. Then drag and drop the video to your location on the page and it resizes automatically. 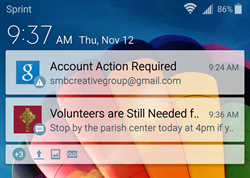 Organize your news and manage announcements with ease. And don't forget... all of this news is included in the Automated Newsletter and pushed out to the Mobile App. It's pretty awesome! What a Feature! 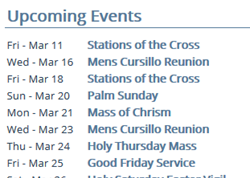 Events that are added to the calendar are displayed on the home page, delivered in the Automated Newsletter and also pushed out to the Mobile App. 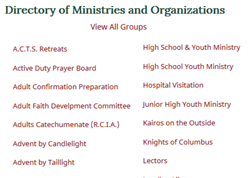 The ministry directory provides an easy way to keep your ministry groups organized on the website. The directory is searchable and can also be organized into categories. 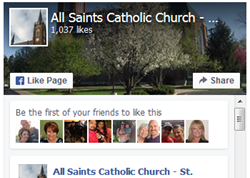 The Facebook module makes it easy to embed your Facebook feedd on to your web page. Just copy and paste the link to your Facebook page. 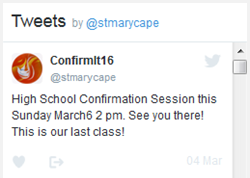 Add a Twitter feed directly to a page by dragging a module into place and then copying the URL from your Twitter feed. It's that easy. 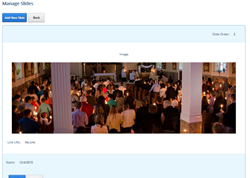 The Slide Show lets you up upload, zoom and crop any photo for the perfect home page rotator. Slides even have expiration dates. 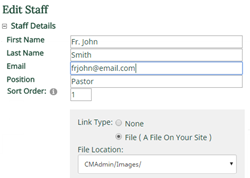 The staff directory is an easy way to organize contacts on your website. The image uploader feature even reduces, centers and resizes photos. 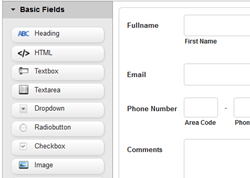 Create forms in minutes with our drag and drop interface. Export data, send approval emails and more. Great for special events! Organize photos into albums with your favorite images. Advance features include bulk Upload, setting image size, albums and thumbnails. 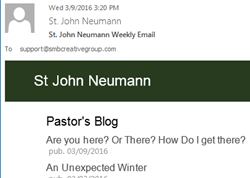 News and events that you add to your website are automatically sent out to your subscribers in a weekly email. This means you can update and deliver news in one step. 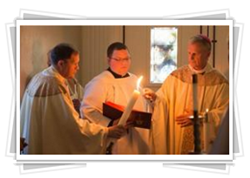 Connect one-on-one with your parishioners. The mobile app integrates directly with your website so you don’t have to manage content in two different places. Once your members subscribe to the Newsletter, you can also send them bulk emails for special events or announcements. 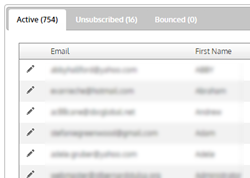 A comprehensive bulk email tool is built in to your website.